At 1st glance Having been partying all weekend, we were in rough shape and there is some pesky law that got in the way of us having some bloody ceasars or bloody Marias (same thing as a ceasar except with tequila). So, we ended up at the same table we were at years ago and noticed that even for arriving at 11-ish, we are some of the first people there. 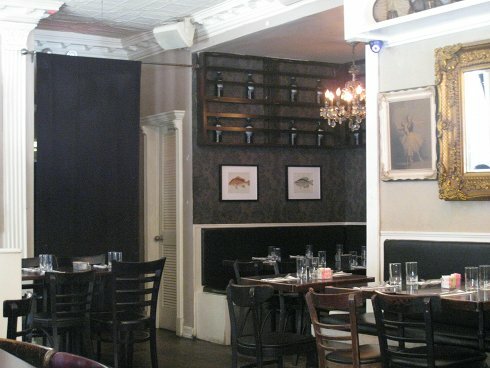 The place is cozy and cute as it has a French bisto look and feel to it. It is very well lit and has a bar on the right with 2 private stall washrooms in the back. There are loads of tables and chairs with a special half circle banquet seat that we got. The crowd,as it filled up, was full of models and beautiful people as well as not-so-beautiful looking older men who seemed to be rich. Food The brunch menu is a one-pager with various items that although are more breakfasty, do have some lunch aspects. I would say half the menu was classic breakfast items like eggs, pancakes and omelettes, while the other half had sandwiches and salads. The food is pretty straightforward; nothing too fancy. Most dishes will run you anywhere from $10-$15 and coffee is not included which is $3, but with free refills. We started off with some entrées since we had to wait for our alchoholic beverages. 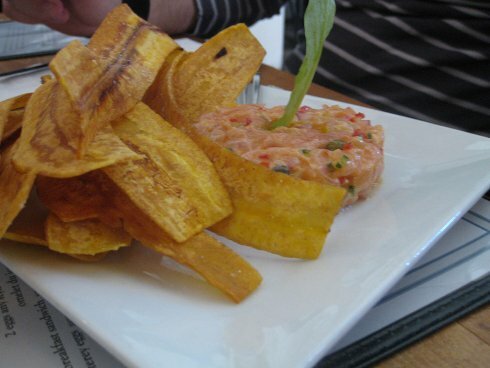 My friend had the Tabasco Salmon Tartare ($13) which came with plantain chips. The dish was well presented and the plantain chips were quite generous. The taste of the dish was refreshing and I considered the plantain chips was a novel idea that looked good and were tasty. 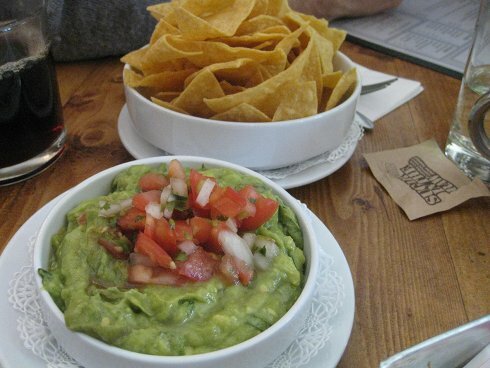 guacamole & chips ($10) was not an enormous portion. The size was ok, but I was expecting a little more. The chips were a nice and necessary accompaniment and the guacamole was fresh and tasty which is a plus.This is not exactly a brunch dish and I would have liked either the price to be a little less or for it to have incorporated some breakfast or brunch aspects in it. On the plus side, it is vegetarian friendly which is helpful for some who find their menu options limited. My appetizer was the fruit dish ($9). Years ago when I was there, this dish had yogourt, nuts and honey. This current version of that dish did not; it just had fruit. I mean I like fruit: it’s healthy, the price was not too and high portion good for one person, but I wanted more, and I did not get it. I think this dish cold be made better quite easily. 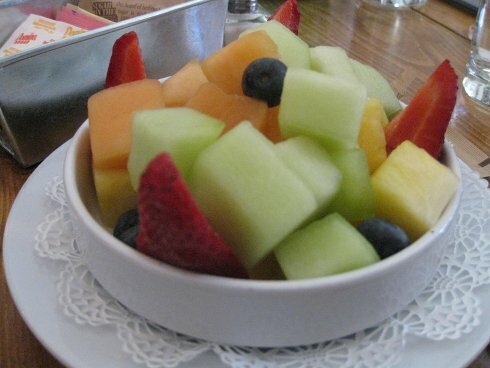 I did enjoy the fruit and much like the previous dish, I do like vegetarian options on any menu. For the main courses, we ordered a bunch of dishes and got a varied feel for the menu. My friend opened with the 2 eggs, any style ($10) which came with bread and potatoes. 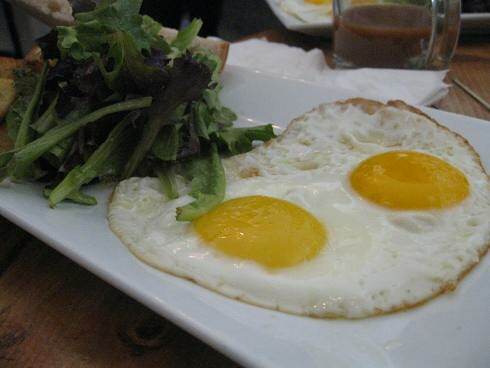 There was nothing really magical with this dish since it was 2 eggs and some sides. I think $10 is a touch much for this.The eggs were ok as eggs go and the salad was not necessary since fruit could have been a better option. 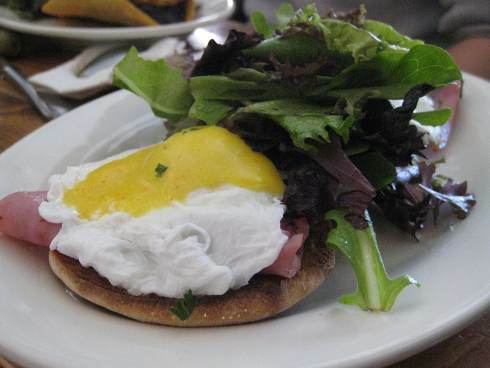 We also had the eggs Benedict ($13). The eggs were a little too overcooked, in my opinion, and were much more firm than wanted. For the same price, you can choose between: ham; smoked salmon and spinach. There was an accompaniment of salad which I felt, again, was not really necessary in this dish. To be honest, $13 for this dish was not an amazing deal. 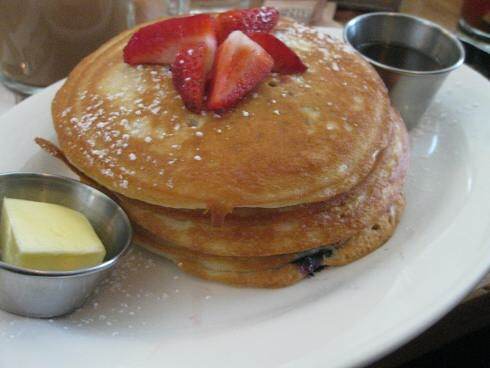 Lastly, there were the Pancakes ($11) which was a generous sized stack with straweberries. The pancakes were fluffy and a little thick. Considering what we paid and what we got, I think it was fair. The portion size was generous and the taste was adequate. I would have liked to have a side of something even if it’s a small one. This extra side could have added a little extra value to the meal. It might seem that potato reviews use the words “home potatoes” and “home fries” interchangeably but it couldn’t be further from the truth. For those who might not know the difference, home potatoes are potatoes that are either machine-cut or hand-cut into cube-like forms and either deep fried or oven baked. 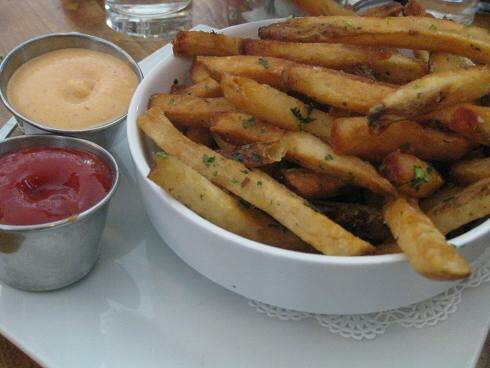 Home fries are almost the same thing except that they are cut into stick-shape formats. Furthermore, the distinction between machine-cut and hand-cut is not relevant in this case since in order to get that stick-shape, they are all machine cut. The difference comes from industrial machine-cut (i.e. McDonald’s) and hand-cranked machine-cut (i.e. a local, one-shop greasy spoon that has been open for more than 25 years). The hand-crank is normally better since it usually means that the potatoes are freshly peeled and kept soaking under water (in order to avoid oxidization) in the back until they are needed. It is only then (but usually a few hours before, but never frozen) that each potato is placed in a hand-crank and the potato is freshly cut into the stick shape form desired. In this case, the home potatoes that accompanied my omelette dish were not spectacular. After having exceptional breakfast potatoes all weekend, I was slightly disappointed. Trying to keep my objectivity, I will still give them a 3.5 on 5. The portions were decent and although the home potatoes were frozen-fried, their potato-skin were left on and the sea salt used was just right. It was their home fries that I rather enjoyed. Although they required to be ordered as a side dish, they were worth it. Crispy potato stick fries (trying to avoid the use of French or Freedom), with their potato-skins left on and doused with chopped garlic and enough sea salt, these were delightful. I actually ordered two sides, above and beyond my meal, that my glutinous ways finished – slowly and with the help of friends. I give the home fries a 4 on 5. They were that good! The service was quite good. 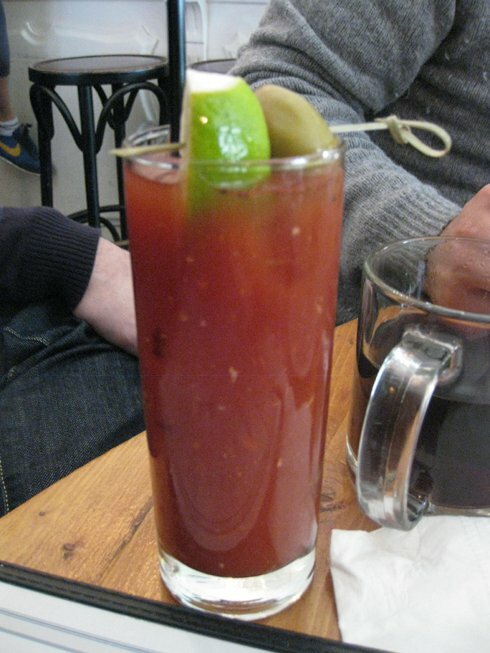 The refills were frequent, the menu was well explained and they were actually very polite and courteous. I always like service in the USA: they seem to do it so well. The menu has a bunch of vegetarian options so you will be safe if you wish to avoid meat. There are no vegan options except for maybe the fruit cup so, better luck next time. 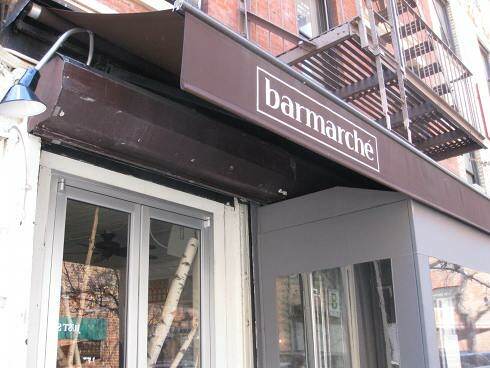 Overall Bar Marche was fair. The venue is amazing and the crowd is impressive. These are the two stand-outs for this place, because the food was not. It was good and at another location it would be considered fair but considering where it was, and how it was, when I went years ago, I felt that it fell short and was average. The experience itself was fun but other places would have offered better food for the price.